Are you frustrated with all the steps it takes to complete Forex trades? Simplify the process! GOW executes your trades in a snap: achieve more, less effort! As an experienced Forex trader, you know the importance of speed when trading. Just imagine what you could accomplish if you had a few shortcuts at your fingertips! Goodbye Order Window (GOW) is an easy-to-use software that allows you to automate various trading routines on Metatrader. Add GOW to Your Trading Arsenal, Be a More Effective Trader! Become a speed demon with GOW and maximize your trading strategy. Tasks like inserting values for Stoploss, Lotsize, Takeprofit and Slippage don't need to be done for every trade. GOW cuts out the repetitive steps so you can get in the very second you spot that perfect trading opportunity. The GOW package has everything you need. You'll never have to look at that Metatrader order window again. Whether you're opening, closing, or modifying an order, GOW makes it simple and FAST! No longer will you have to think in numbers and figures. With GOW, you'll see the lines that represent your Stoploss and Takeprofit values. To adjust their values, simply drag the lines to the levels you want. If your broker won't allow small Stoploss or Takeprofit values, you can use Virtual Stoploss and Takeprofit to set smaller-than-allowed stop sizes. Their values will appear as lines on the chart, and the trade will leave the market as soon as the price touches either of those lines. Using this function, you can hide your Stoploss and Takeprofit levels from your broker and avoid being caught in a "stop-hunt." Type 1: Risk Percentage. Risk a percentage of your current account balance.*. Type 2: Risk Per Money. Maintain a fixed ratio between lotsize and account balance. For example, if you want to open 3 lot on a $10,000 account, and your account is currently worth $1,000, GOW will open trades at 0.3 lot per trade. 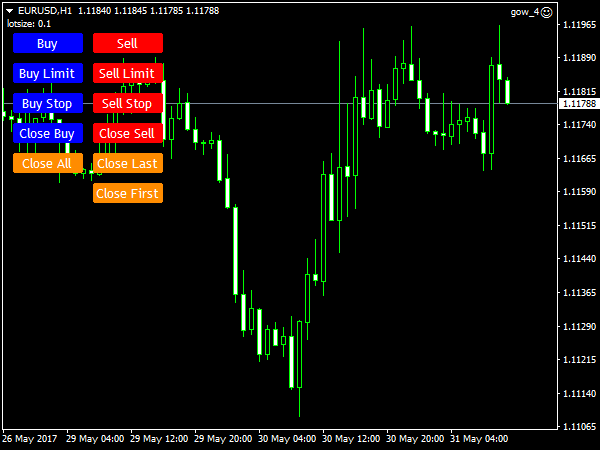 Break Even - Set the break-even point for your trades, quickly and easily. Profit Lock-in - Beyond break even, GOW lets you lock-in profits. 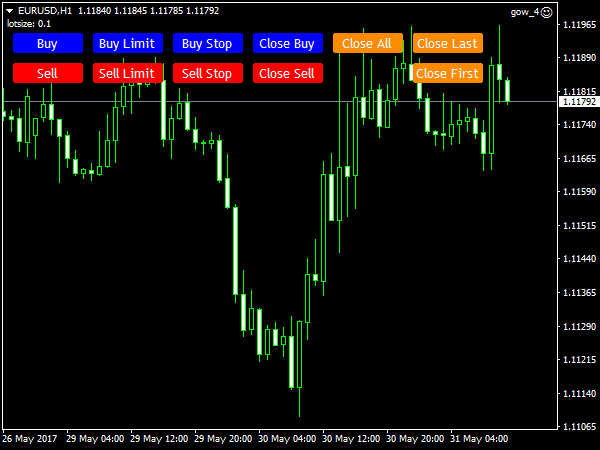 Trailing Stop - Now you can set the start of the trail for Stoploss, the size of the trail and even its step, and the level at which to stop trailing! Maximize your manual trading strategy by enabling yourself, the trader, by applying tools that make trading easier and more enjoyable. To resellers and customers who would like to have a customized version of GOW, the source code can be provided at no extra cost. Free Yourself From Order Window Hell, Get GOW Now! If GOW isn't as we promise, you can request a full refund within 60 days (terms and conditions apply). We are confident that once you try GOW, it would be indispensable!